For those who love to keep up with styles and trends. These beauty gifts are perfect! 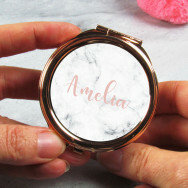 From makeup bags to compact mirrors, these beauty gifts are beautifully personalised to make them unique for that special someone.